Simulation Modeling and Analysis with Arena is a highly readable textbook which treats the essentials of the Monte Carlo discrete-event simulation methodology, and does so in the context of a popular Arena simulation environment.” It treats simulation modeling as an in-vitro laboratory that facilitates the understanding of complex systems and experimentation with what-if scenarios in order to estimate their performance metrics. The book contains chapters on the simulation modeling methodology and the underpinnings of discrete-event systems, as well as the relevant underlying probability, statistics, stochastic processes, input analysis, model validation and output analysis. All simulation-related concepts are illustrated in numerous Arena examples, encompassing production lines, manufacturing and inventory systems, transportation systems, and computer information systems in networked settings. · Chapters are devoted to a variety of Arena models capturing a range of real-world applications, including production lines, supply chains, transportation, and computer information systems. Simulation Modeling and Analysis with Arena is a highly readable textbook which treats the essentials of the Monte Carlo discrete-event simulation methodology, and does so in the context of a popular Arena simulation environment.? It treats simulation modeling as an in-vitro laboratory that facilitates the understanding of complex systems and experimentation with what-if scenarios in order to estimate their performance metrics. The book contains chapters on the simulation modeling methodology and the underpinnings of discrete-event systems, as well as the relevant underlying probability, statistics, stochastic processes, input analysis, model validation and output analysis. All simulation-related concepts are illustrated in numerous Arena examples, encompassing production lines, manufacturing and inventory systems, transportation systems, and computer information systems in networked settings. Contents: Chapter 1 Introduction to Simulation Modeling; Chapter 2 Discrete Event Simulation; Chapter 3 Elements of Probability and Statistics; Chapter 4 Random Number and Variate Generation; Chapter 5 Arena Basics; Chapter 6 Model Testing and Debugging Facilities; Chapter 7 Input Analysis; Chapter 8 Model Goodness: Verification and Validation; Chapter 9 Output Analysis; Chapter 10 Correlation Analysis; Chapter 11 Modeling Production Lines; Chapter 12 Modeling Supply Chain Systems; Chapter 13 Modeling Transportation Systems; Chapter 14 Modeling Computer Information Systems; Appendix A Frequently Used Arena Constructs; Appendix B VBA in Arena. 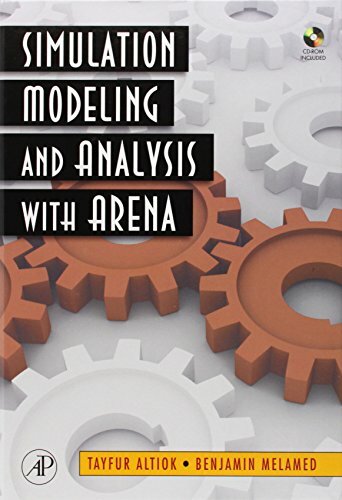 Simulation Modeling and Analysis with Arena is a highly readable textbook which treats the essentials of the Monte Carlo discrete-event simulation methodology, and does so in the context of a popular Arena simulation environment. It treats simulation modeling as an in-vitro laboratory that facilitates the understanding of complex systems and experimentation with what-if scenarios in order to estimate their performance metrics. The book contains chapters on the simulation modeling methodology and the underpinnings of discrete-event systems, as well as the relevant underlying probability, statistics, stochastic processes, input analysis, model validation and output analysis. All simulation-related concepts are illustrated in numerous Arena examples, encompassing production lines, manufacturing and inventory systems, transportation systems, and computer information systems in networked settings.